An unauthorised settlement in the West Bank, illegal even under Israeli law, appears to be benefiting from state funding, the BBC has uncovered. 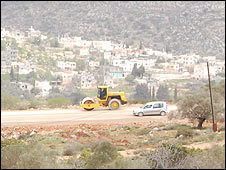 A road is being built from the established settlement of Eli, near the Palestinian city of Nablus, leading east to the illegal outpost at Hayovel. Settlement expansion is a major barrier to an Israeli-Palestinian peace deal. The international community regards all settlements in the West Bank as illegal under international law. Israel disputes this, but even under Israeli law, those newer, smaller settlements - known as outposts - which have not received authorisation from the government are deemed, by the Israeli government, to be illegal. Drive up the twisting, landscaped roads of Eli, a mid-sized settlement in the heart of the West Bank, and you come across a scene of intense construction activity. Lorries, tractors, and graders are digging, laying and smoothing a new road, more than a kilometre long. The road leads east to the outpost of Hayovel. The road-building is not difficult to spot. But outside observers are not welcome. The BBC was asked, twice, to leave the settlement, when we drew too close to the site of the road. Since the publication of a government-commissioned report into outposts, four years ago, they were supposed not to receive any further support from the authorities. Indeed, the outgoing Israeli government promised to start dismantling the existing outposts. That did not happen. Late last year, however, after an increase in violence from a minority of settlers, aimed at Israeli security forces, the cabinet announced an absolute cut-off in all public funding to the outposts. The new road suggests that the reality is otherwise. A 10-minute drive away, from Eli, four Palestinian villagers are clambering their way around an earth mound which is blocking their route by car. The mound has been placed by the Israeli army for, it says, security reasons. For Abdel Nasser, a civil servant with a job in Ramallah, there is a double bind. Not only is his journey to work almost double the length it used to be - 43 rather than 22 kilometres. But, as he shows on a map, the new road to the outpost carves straight through land which he says is owned by his village, Qaryut. "The settlers took this land," he says, "maybe 5,000 dunams (500 hectares). They opened the road between Eli and Hayovel one month ago. It's private land, owned by our people." On his map, the road is marked by a red line. It cuts directly through a patch of green land. The significance of that colour is that it is the shading the Israeli authorities themselves use to indicate land which they regard as privately owned by Palestinians. 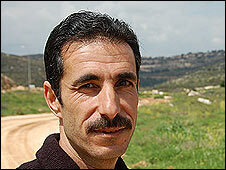 Mr Nasser says that neither he nor anyone else in his village has sold the land, or received a military seizure order. The BBC asked the relevant government and military departments why this road was being built on what their own map indicates is privately owned Palestinian land; and how this road tallied with the government policy of no public funding going towards outposts. No-one was able to provide the BBC with an answer. However, in a fax to the Israeli human rights group, Yesh Din, which has been investigating the issue of the road on behalf of the Palestinian villagers, an official from Israel's Civil Administration said that the matter was now in the hands of "inspectors". For Dror Etkes, the veteran investigator who works for Yesh Din, the answer is simple enough. The reason for the road-building, he says, is because of the "tragic" gap between what the government says and what it does. "The Israeli government is simply not willing to take the most basic responsibilty - which is to enforce the law. Historically, they have always preferred to allow the settlers to do whatever they want, in order to prevent unwanted confrontation with Israeli citizens living in the West Bank," Mr Etkes said. All this has been happening under a government which is publically committed to the eventual establishment of a Palestinian state, in the West Bank. The future Israeli government, which is likely to come into office next week, will be led by a man, Binyamin Netanyahu, who sees no such need. President Barack Obama may have reiterated, this week, his determination to see a Palestinian state. That goal will not depend on Israel alone. But, as it is, the momentum on the ground appears to be swinging the other way.